One of the few problems with living in the USA desert southwest (not counting my opinion of the area’s water policy) is using the kitchen oven in the summertime. When it’s 110F/43C degrees outside, like it is right now, it seems foolish to pay to heat the oven that ends up heating up the kitchen at the same time I’m paying to have the air conditioner keep the house cool. The neighbor across the street mentioned that his kitchen range (combination stove and oven) wasn’t working. I offered to fix it for him (these are easy to fix), but he had already purchased a new one. He went on to say that he was going to put the old one out on the sidewalk with a “free–needs fixing” sign on it and if it was still there the next morning, he would pay to have it hauled to the recycling facility. I saved him the need to pay to have it hauled away and brought it to my enclosed back porch. The prior owners of our house had an electrically powered hot-tub and the electric outlet for it was still in place. The stove needed an electric circuit with less capacity than was needed for the hot tub, so I simply changed the circuit breaker to a smaller one and changed the electrical outlet to the correct one. The wires are slightly larger than needed, but that’s perfectly acceptable. Every Thanksgiving holiday I’ve complained about not having enough stove and oven space and every summer I’ve complained about paying to heat the house that I’m also paying to keep cool. I’ve fixed two of my complaints for less than $100 and 2 hours of time. It turned out that the appliance parts store was only 1-1/2 miles (2.5k) from the house, so I walked there and even got some exercise in the process. I got home, ate some food, drank some water, did some yard work and then decided to go running. It was 103F when I started. After about 1-1/2 miles on the trail, I decided I’d turn around early and head back to the car. On the way back to my car, I was sweating enough that I began to think, “If I collapse and die out here, will the medical examiner need to examine my bone structure to determine my gender?” Farther along, I began to think of “The Night of the King’s Castration”. I made it back to the parking lot….looking like I had crawled out of a swamp and laughing out loud. I guess looking like one had crawled out of a swamp and laughing out loud is enough to concern the park rangers. As I walked to my car, a ranger approached me to find out if I was OK. So, I told him why I was laughing. And the ranger laughed, but not because he had to. At 7:32am PDT, the car I was driving reached a milestone. 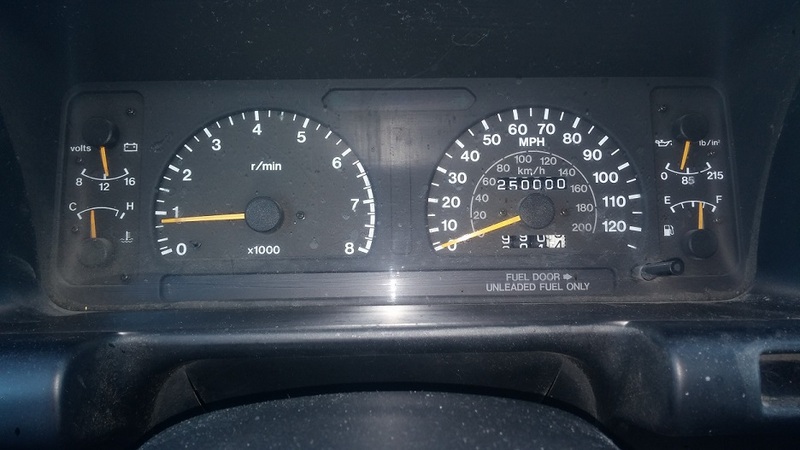 250,000 miles. It’s my 1995 Isuzu Trooper. I’m hoping I can continue to drive it for another 5 or 6 years. I have high hopes that this will happen. Right now, it’s after 10pm, it’s still over 100F (a bit warmer than 35C) degrees and I’m sitting outside watching chicken cook on the grill. This food is for tomorrow evening. It’s nothing fancy. I do like “cooking fancy”, but not after 10pm. I think she had it easier when she was working as a nuclear engineer, but that wasn’t her passion. Teaching is her passion. I understand.